Olympiastadion – Hertha v Frankfurt was a hard-fought encounter that ended in a 1-0 victory for the Berlin-based club, who moved into the sixth position in the Bundesliga. Marko Grujic headed in Marvin Plattenhardt’s corner just before half-time which was enough to give Pal Dardai’s side all three points. 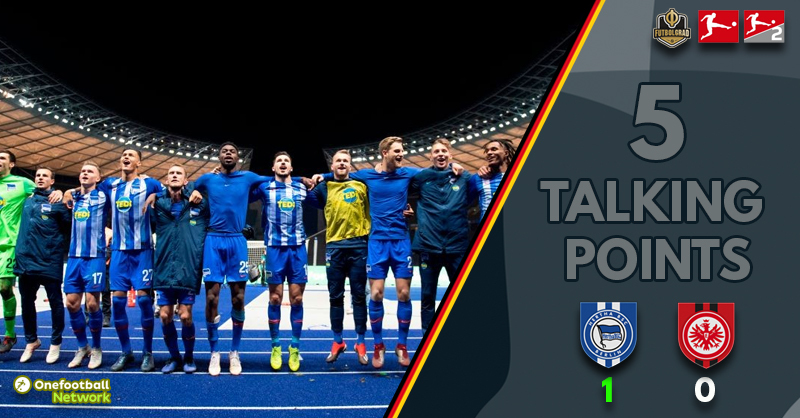 Hertha Berlin started the season in great form with wins against Schalke, Borussia Mönchengladbach and Bayern Munich giving reason to believe a European spot was a legitimate target. November wasn’t kind, however, with heavy defeats against Leipzig and Fortuna Düsseldorf followed by a dramatic 3-3 draw against Hoffenheim. Hertha have won two straight games to start December to jump into sixth. Disciplined performances have resulted in consecutive clean sheets for a side that have been giving up the most expected goals against this season, only recently overtaken in that statistic by rock-bottom Fortuna Düsseldorf. Mathew Leckie spoke to reporters after the match about the recent turnaround, saying the six Bundesliga games Hertha went without a win forced the team to become more compact as a team. “Our performances weren’t too bad, but we had to become more compact as a team again. Berlin is known to be a tough team to score against in the past, and at the start of this season, we knew we had to bring that back”. Marko Grujic stood out once again with the winning goal and man of the match award, but the win was due to a strong and disciplined team performance. Jordan Torunarigha and Fabian Lustenberger were immense in central defence, and Arne Maier provided valuable insurance against Frankfurt’s attacking trio. Pal Dardai made some recent adjustments with Davie Selke and Vedad Ibisevic starting together for the second match in a row. Selke played in an advanced position with 34-year-old Ibisevic taking Ondrej Duda’s position in the #10 role. Time will tell how the partnership develops, but Selke was dangerous including scoring from an offside position before beating the offside trap minutes later, Kevin Trapp doing well to make a smart save. I was impressed with Marko Grujic in the 2-0 win at Schalke on Matchday 2, but he missed some matches after a horror challenge from Borussia Mönchengladbach’s Patrick Herrmann on Matchday 4. Recently making his return against Hoffenheim, the big Serbian has come back with a bang. The Liverpool loanee made a game-high five dribbles, seven aerial wins and seven clearances in the 2-0 win against Hannover last weekend. Grujic earned a WhoScored.com rating of 9.0 despite picking up a yellow card and failing to register a goal or an assist. Against Eintracht he was at it again, putting in a disciplined defensive performance while having the most tackles and shots for Hertha including the winning goal. Leckie described Grujic’s impact, saying: “Marko is a great player, he has brought a lot to the team and is a little bit different to our other midfielders, really big boy, technically very good, likes to drive with the ball when needed which can sometimes that can unsettle the opposition”. 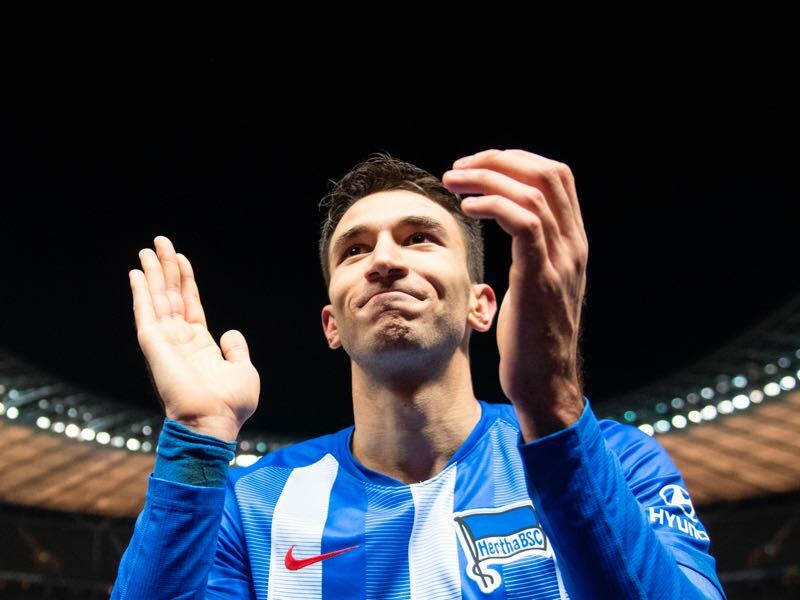 There is no doubt Hertha are a much better team with Grujic on the pitch, and they will try and sign the midfielder permanently. With Liverpool’s riches in midfield and Grujic unlikely to break into the Reds’ first team, it could be a realistic option. The Eagles won 10 and drew one of their previous 11 matches in all competitions before two straight Bundesliga defeats has seen Adi Hütter’s team slip out of the top four. Sebastien Haller hit the post early on, and Frankfurt had more chances throughout the match, but Hertha goalkeeper Rune Jarstein wasn’t seriously tested. Most of Eintracht’s chances were either weak or blocked, but there appeared to be a legitimate penalty claim when Luka Jovic was held back late in the match. The regular statistics and expected goals metric shows that Frankfurt might have been unlucky, but Hütter may be forced into a formation or personnel change on the back of these defeats. Eintracht had scored in 19 straight matches before this result, but the question must be asked if the lack of tactical flexibility has made them predictable. This was my second straight Bundesliga match at a stadium where a running track surrounds the pitch after visiting Nürnberg on Monday night. It’s not an ideal situation, and Hertha moving into a new 55,000 capacity stadium by 2025 can’t come soon enough in my opinion. The Olympiastadion is fine for the DFB-Pokal final and German national team games, but Bundesliga football deserves purpose-built stadiums with the supporters closer to the pitch. There were 42,578 spectators in the 75,000 capacity stadium against Eintracht which says it all. The Hertha ultras were impressive tonight, and hopefully, the new stadium can become a reality sooner rather than later.